How many men do you see sporting a billowy, unkempt-looking shirt? Most men probably have no system for tucking in their shirts. Just because you do something, doesn’t mean you are doing it correctly. 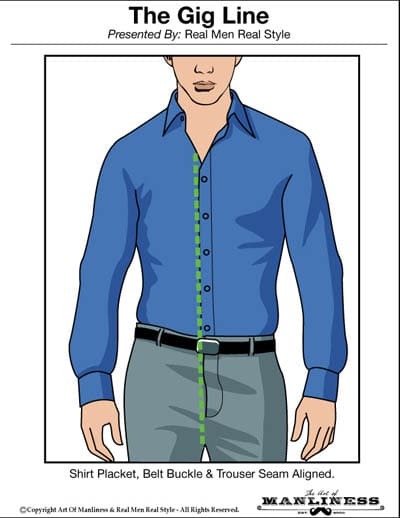 The goal of this article is to expose you to a few tactics that might eliminate the nuisance of an un-tucked or wrongly tucked shirt. Shirts that are made with a flat bottom hem are meant to be worn untucked. But if the shirt has visible “tails” — that is to say, the hem varies in length, rather than being even all the way around — it should always be tucked in. Wearing a shirt with tails untucked is not a forbidden look. But it is a juvenile one. With nothing else on the upper body, it makes you look like a teen rebel at a grown-up wedding. Under a jacket or with a suit, being untucked makes you look like you’re trying too hard to be stylishly rumpled. There are men who will insist on the artfully un-tucked shirt. More power to them. But for my money, tucking in a shirt with tails will always give you a sharper and more mature look. Undershirts — These can always be tucked, and absolutely should be if there’s any chance of them poking out from beneath your other layers. For best results, tuck undershirts into underwear (more on this below). Polo shirts — They have an even hem and can be worn untucked, but are often tucked in for a little dressier look, especially by golfers. Rugby shirts, their long-sleeved cousins, are almost never tucked in, however. Turtleneck/roll collars — When worn under a sports jacket or blazer, these are often tucked so that the belt buckle is visible. On their own, it’s better to leave them untucked. Hawaiian shirts — These and any other loud-print shirts don’t get tucked no matter what their hem looks like. Seriously, just don’t. Nothing looks dorkier than a tucked-in vacation shirt. This goes for Guayaberas as well. T-shirts — Opinions are going to vary widely here. Some subcultures love the tucked T-shirt with the visible belt buckle; others will think you look like a total nerd. It depends a lot on the shirt, the belt, and the trousers, as well as your overall style. In general, don’t tuck the T-shirt unless it’s a deliberate style statement. What Is the Proper Way to Tuck in a Shirt? When it’s time to tuck in your shirt, do it the right way. A good tuck should make the front of your body smooth and flat. If your waist tapers below your rib cage, that should be visible. There should be no wrinkling and no “muffin-topping” — where the shirt blouses out over the trouser waist and makes a ring around your midsection. You should also have a clean “gig line” — a military term for the imaginary line straight down the front of your body, from the point of your chin to your crotch. A well-tucked shirt should sit so that the shirt placket (the rectangle of fabric where the front buttons are located) lines up precisely with the fly of your trousers. The belt buckle and trouser button should be centered neatly in that same line. A clean gig line divides your body cleanly, emphasizing evenness of proportion. It also tells people that you pay attention to detail — or it might be more accurate to say that a sloppy gig line tells people you don’t. Either way, you want it crisp and vertical. Finally, keep in mind that a good shirt fit in the first place will always make tucking the shirt in easier. The less excess fabric you’re dealing with around the waist, the less your tuck has to secure. A well-fitted shirt is also sure to be long enough for an effective tuck, while a short shirt will always be in danger of escaping no matter how well you tuck it. This is where most men start and finish their shirt-tucking education — shirttails inside the trousers but above the underpants, shoved straight down all the way around the waist. It’s the no-thought way to do it, and it’s the most common as a result. Here’s the easiest way to do this one, and you’ve probably done it a million times unless your father taught you a different method from a young age: put your underwear on, then put your shirt on and button it up, and then finally pull your pants on, buttoning them closed over the shirttails. Your shirt ends up pinned beneath your trousers with no effort on your part. It just got there by virtue of the order you did things. And as long as your trousers aren’t too loose, the shirt will probably stay there. Just because it’s easy doesn’t mean this is a bad tuck. If you don’t want to think too hard, this is the way to go. But be cautioned: it works well with a fitted shirt, and terribly with anything else. If your shirt doesn’t have a close, well-tailored fit, you need a little more technique to deal with the excess fabric.